There's consternation at the climate conspiracy blog WattsUpWithThat.com (WUWT). Kip Hansen, a random denier dude, is ropeable. 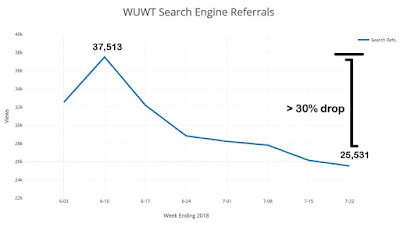 He's most upset because, in June this year, WUWT had a big drop in click-throughs from Google. A 30% drop, according to Kip (Google cache here :D). Now this isn't about paid-for click-throughs (via Google AdWords). It's just about the freebie service that everyone gets. Here's his evidence that the Google algorithm is working better. Feel free to celebrate or commiserate. Kip voiced his concern in a mixed up diatribe against the search engine giant, angered that it is endeavouring to combat 'fake news'. After all, any attempts to downgrade websites that promote lies about climate change could be affected, if Google meets this objective. This would naturally concern the purveyors of lies and conspiracy theories. What about statistics? Bayes or Frequentist? Some in each camp of thought consider the other camp to be utter nonsense — but which one do we demote or de-rank as “misleading, low quality, offensive, or downright false information.” Or do we make sure to include information equally from both sides? Or favor one side a little? A lot? Or pretend that they could both be equally valid? Or let the citizenry decide by giving equal access to all statistics texts or links based on popularity? Kip worries about the fate of Edgar Allan Poe and Mark Twain, the right of Americans to shoot people, and the right of men to tell women what to do with their bodies; but doesn't mention anti-vaxxers, flat earthers, gravity deniers, HIV/AIDS, or Pizzagate pushers, which are interesting omissions. Yeah! Climate change conspiracy theorists going on a Google strike. That'll show 'em! If he does not have any data before, it would still make sense to say: roughly between 15 and 30%, rather than to claim it is 30%. If it is 30%, he should show the evidence. The algorithm is likely not intelligent enough to notice and derank that WUWT post. I can just click on all the links in any of the WUWT hater blogs. While there are no rules about this at HotWhopper, it's generally considered good etiquette to use a consistent nom de plume when commenting on a blog. I'll tolerate a fetish with "G" names, if that's your thing, at least until your behaviour merits banning (again). Conspiracy theorists need Google. It's a pretty significant recruiting mechanism of course. Viral nuttiness needs disease vectors, pretty standard epidemiology. Conspiracy Theorists never miss an opportunity to play the victim. They just hate it when the Universe does not comply with their beliefs as it means the Universe is in on the Conspiracy. 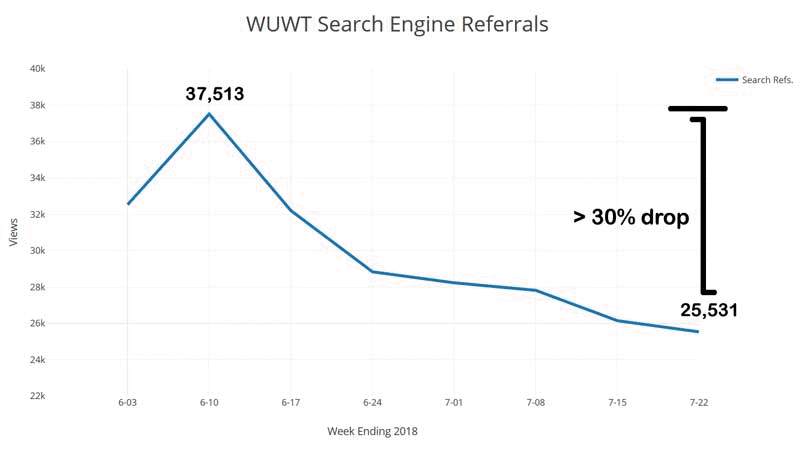 I would not have thought search engine referrals make up a great deal of WUWT's traffic: its not like sock puppets use Google. Also sock puppets often use Google. It is so good that many people do not bookmark (much) any more. The graph above indicates that nowadays about 100k page views per month come (recognisably) from Google. WUWUT claims to have 3 million page views per month. So that would be 1 in 30. For my blog it is less: 1 in 40. I guess I should start playing the victim like a conservative. Many people surf in a way that you no longer see where they previously were and thus cannot see whether they came from Google. So the actual amount of traffic from Google is likely (much) higher. Miriam ==> As always, a pleasure to have been featured on your blog once again …and in such an amusing way. Brightens my day to know that my work is effective enough to need attacking by the Climate Team’s pet attack kitty. Just like their leader Trump: only interested in ratings and not interested in reality: does not even respond to the above mentioned problems. "my work is effective enough to..."
That's the point at which I went from amusement to laughing out loud. The cause of Climate Comedy? What a waste. I wonder if there was ever a time when Anthony Watts believed he would be part of a movement that toppled the prevailing consensus/paradigm on AGW (that it is real and if we continue on our current trajectory, the effects will be largely, perhaps devastatingly, negative)? After all he was lead author of the 'game-changing' Watts et al 2012, surely to be actually published any day now. Ah, but how things have changed since the heady days of ClimateGate, now long dismissed and forgotten. Claim after claim that climate change was nothing to worry about as none of the dire predictions of record temperatures, worldwide heatwaves, coral bleaching and so on were actually happening. Now my lawn is crispy, our green and pleasant land is largely yellow and food prices are set to rise. Heat records have tumbled around the globe, which has also brought us fatal heatwaves. Tourist numbers to the Great Barrier Reef are in decline as it experienced unprecedented severe bleaching on successive years. Here in the UK, even The Sun (a Murdoch-owned, right wing populist tabloid) is quoting a climate scientists saying 'Global temperatures are increasing due to climate change. The global rise in temperatures means the probability that an extreme heatwave will occur is also increasing.' (Trust me, this would have been unthinkable just a short time ago). Steve McIntyre, the brains of the operation, has decamped, having posted nothing on climate for over 8 months, apparently thinking that football inflation, political email hacking and the Douma chemical attacks are better targets for his forensic skills than climate. So, 'It is not happening', which was never actually the case, is an even less tenable position right now, and the response has been revealing, and by the way, hilarious. Anthony's Three Stooges: Kip, David and Eric have responded to the challenge, dashing off a stream of 'look - a squirrel' articles, interspersed with logically-challenged pieces claiming that what we're seeing is nothing extraordinary, salted with the usual um, selective use of statistics. But you click on the link and it takes you not to the RS study, but to a Washington Times piece which indulges in a bit of Wattsesque pea and thimble work, globally it is area burned that counts, but in California they only detail the number of fires. ( Here is why. ) Go read the actual study and they attribute the decline to changes in agricutural practices. Human activity influencing climate in other words, can't have that can we? Meanwhile, the commenters expend as many words on their hatred of science, socialism, liberals, the left, crooked Hillary and enviro-terrorists as they do on AGW. The dustbin of history awaits. Sad. (But very, very funny). See also Was this the heatwave that finally ended climate denial? Oh, Did I mention Christopher Monckton? A peer of the realm, self-destructing before our eyes. There may not be enough popcorn. So Mr Hansen, nothing interesting to add? I wonder what motivates a person to contribute to an anti-science campaign in the 21st century, I really do. His motivation? Reading his posting again today, I'd say he is positioning himself as the David Brent of climate change denial. His motivations are probably the same as David Brent's and the key shared trait is an inability to realise what an utter prick he is making of himself. Ha ha - thanks. I've now commented on it, David. It's been dry - hence frosts. Kangaroos don't usually die from frosty nights. It was the second hottest July on record for Canberra this year. It's not just Canberra, it's warming globally I've heard. Nice one Sou! Notice that Anthony has so far avoided all mention of the UAH update btw. 4th warmest July on record globally during ENSO neutral conditions.. maybe not the look he's after.